Excellent walk on a hot summer's day last weekend. A nice mix of landscapes, with woodlands in the first half (refreshingly cool) and then more open spaces in the second half. Got lost once, but must have missed one of the yellow trail signs, which were plentiful. We picked up the trail again fairly quickly. Very quiet route, hardly saw anyone else, which made it very peaceful. Pub stop was welcome, but the Barley Mow isn't the greatest pub in the area. It's OK. Weakest section of the walk is the last, just a straight path on the side of the railway back to Horsley. Overall a good longish trail. Took just over 4 hours including the pub stop. A lovely walk with a great mix of scenery: woods, commons, meadows, farmland and fields. The Lovelace buildings and bridges were pleasant additions en route. Very well-signposted for the most part but found it got less clear after St. Mary's Church. A great circular walk through the woods and meadows with interesting views and a well marked route. The walk takes in a number of Lovelace bridges and buildings too. The Barley Mow pub is a great place to end for food and drink. 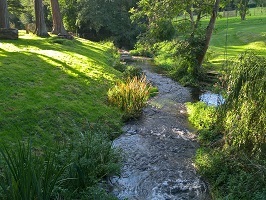 The Horsley Jubilee Trail is a circular walk using mainly public footpaths and bridleways. You’ll come across the delightful ‘Lovelace’ bridges as well as the stunning Horsley Towers. The total distance of the trail is approximately 14.5km (9 miles) and it rises to over 175m (570ft) at its highest point along the broad ridge of the North Downs. The walk takes you through open country, woods and farmland with the minimum of road walking. Proceeding at a comfortable pace, allow 4 to 5 hours. The Horsley Jubilee Trail was named because it was not until the year of the Queen’s Golden Jubilee that the complete trail became possible due to the acquisition of The Forest, and the designation of a new right of way, which provided the final link in the circuit. Forest, to join a crossing track and waymark. Turn right, following gently rising path to junction and waymark. Turn left, and at junction continue ahead, then bearing right around gardens of houses in The Highlands, then bear left to follow a clear wide track. Nearing the railway, the path veers a few degrees left becoming narrower, and parallels the railway until it rejoins the verge of The Drift. Turn right to reach Forest Road. Turn right and cross railway bridge to end of pavement. Cross to opposite pavement by corner of Orchard Close, and continue along Forest Road to next left turn. Opposite is Forest Farm an interesting Lovelace building. Turn left down Heath Way which turns right at edge of common, and turn left into woodland at bridleway sign, immediately turning right along the edge of Effingham Common. Continue along bridleway to far top right corner of Common by Heath View. Look back for excellent views that extend to the Chilterns. Cross road diagonally left, following bridleway, Old London Lane, into woods. Go past a footpath going right over a footbridge in about 165m, by which a return to East Horsley and the Station may be made. In another 135m Great Ridings Wood Woodland Trust display board is reached on left. Turn left by display board and go through horse barrier. In 50m, fork right at waymark and follow footpath through wood. After crossing a bridge, continue up the slope turning left at waymark. Take clear track ahead for 200m, turning right downhill along a surfaced track. Leaving the Orestan Lane entrance of Great Ridings Wood, cross lane diagonally left to join footpath through Parrott’s Copse.Follow waymarks to rejoin Old London Lane. Turn left continuing to Dirtham Lane, and the A246. Turn right along pavement to get clear view in both directions, cross road with caution to bridleway opposite. Keep diagonally left ahead at bridleway fork, and after 1km, at a waymark, turn right on bridleway passing under Stony Dene Bridge. Turn left on bridleway at end of bridge embankment.If desired, in 10m, follow short marked path to right for 50m to get a good view of Horsley Towers to the north, then return to trail. Continue to wide forestry track, turn left, then shortly right, on yew lined track. Follow this ancient hollow way uphill to turn right on a wide track. Pass Forestry Commission sign and continue ahead to Crocknorth Farm. 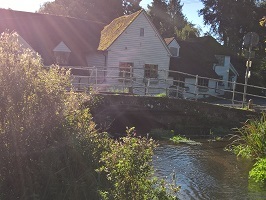 Lovelace bridges to reach Green Dene. Cross road diagonally right, take bridleway uphill into the Sheepleas. After 500m at top of hill, take left track at three-way fork. At next junction with a crossing bridleway, bear left then turn right at waymark, with fields to left. Ignore joining tracks until next crossing with a bridleway, and turn right. Shere Road car park is to the left. Passing Angel Clump, the Millennium Viewpoint is to the right with excellent views. From viewpoint continue down grassy slope to a shallow valley then bear left and up another slope. Go through a horse barrier, then bear left past St Mary’s car park signpost. Pass through another horse barrier and cross two flower meadows to reach A246 at St Mary’s Church, founded 1030. Church House, an ancient building just past the church is worth seeing, before crossing the A246 to pavement opposite. Squire’s Garden Centre with a restaurant and coffee shop is a short diversion to the left along pavement. 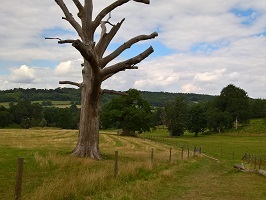 Go through gate bear left, then immediately right along field edge path with views of West Horsley Place. Continue past two fields to meet crossing hedge. Turn left in front of hedge, and continue through woodland edge, alongside a field, to a junction of paths. Turn right, cross stile to reach road by village green, with its massive oak tree. Cross road with care. The 16th Century Barley Mow Pub is a few paces to the left. Turn right along pavement, soon passing interesting medieval houses on left, to junction with Long Reach. Cross traffic islands to get good view both ways, cross road to go along Lollesworth Lane. Note Lollesworth Farm, of great historical interest, on right. At far side of railway bridge, turn left alongside railway, soon passing Village Hall to reach shopping parade. Turn left on pavement, then cross road to steps opposite to the Station.